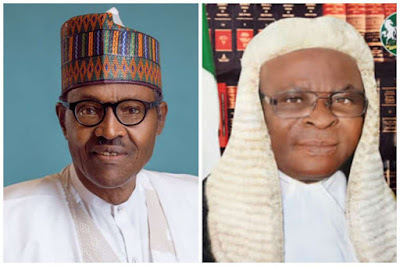 A retired Director at the Code of Conduct Bureau, CCB, Mr Awal Yakassai, on Thursday, testified as the second prosecution witness, PW-2, in the ongoing trial of the suspended Chief Justice of Nigeria, CJN, Justice Walter Onnoghen, who is facing trial over his alleged failure to declare his assets. Yakassai told the Mr Danladi Umar led three-man panel of the Code of Conduct Tribunal, CCT, that contrary to what was alleged in the media, the suspended CJN owned only five houses. He said it was not true that CCB investigators linked the ownership of 55 houses to Onnoghen. Answering questions under cross-examination, the PW-2 told the tribunal that he served at the CCB for 29 years before he retired in April 2018. He even confirmed that the CCB was yet to verify Justice Onnoghen’s assets with a view to finding out if he made false declarations. So why the rush to bring down Onnoghen? Awomolo noted that one of the five buildings was even given to Onnoghen by the federal government. Recall that the Federal Government had claimed that it was the CCB that okayed Onnoghen’s trial based on certain infractions that were discovered in his asset declaration forms.